In addition to the sewing machine and two extremely useful kitchen gadgets, a turny-handle whisk and a mini grater, my wonderful boyfriend bought me this wonderful book for my birthday. As you may have guessed, it’s in two sections, one about growing vegetables and one about seasonal cooking. The gardening bit has lots of handy hints for the novice gardener (although most of my gardening advice still comes from my dad, usually after a panicky text message, or an emailed photo accompanied by the question ‘What’s this?’ to which he replies ‘a weed’). 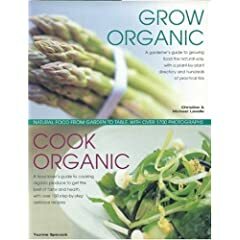 It covers things like crop rotation, companion planting, storage etc, and has a directory of plants with guides to propagating, planting out, care and harvesting. The part has lots of recipes arranged by season, and a section at the end with several recipes for bread and some sauces and salsas. Coriander experiments aside, I haven’t actually grown or cooked anything on the advice of the book yet, but it has been good bedside reading and given me lots of ideas for what may be feasible to plant next spring. picking up plant pots in charity shops like nobody’s business. Entry filed under: books, garden.